"We have a generation of young people who are frightened to go home in the evening, because they're worried about crossing the road into another postcode and ending in the territory of a gang they know will do them harm," he told the cross-party committee of MPs. "We've got a generation of very frightened young people, who do well in school, but as soon as they leave the school gates are fearful of their lives." In terms of improving safety and providing reassurance, Mr Simmons defended the police's use of stop and search as an "effective measure to reduce the likelihood of people carrying knives". But he said he recognised it was an "intrusive power" and needed to be guided by intelligence and from working with young people. 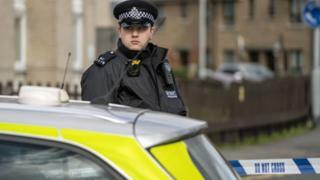 The assistant commissioner said the Metropolitan Police would be "investing heavily" in putting more police officers to work full-time in schools in the capital. Mr Simmons said there had already been an increase from 280 to 420 officers - and there was a target of having almost 600 officers in schools. "We're recruiting currently to get to that point," said the assistant commissioner. Asked if there was a link between teenagers excluded from school and knife crime, the assistant commissioner said exclusion was "one of the factors that crops up significantly" among those involved in knife crime but it was not necessarily a "causal relationship". Robert Halfon, who chairs the committee, then said it was a "red herring" to debate whether exclusion was a direct "cause" of knife crime. He said it was clear that the profile of pupils at risk of exclusion would be similar to those at risk of getting involved in crime - and the priority should be for "early intervention". Sir Michael said schools often acted as "surrogate parents" in looking after children - and as a head teacher he was aware excluded pupils were in "great danger of being pulled into crime". Sir Michael said there was "no question" that decisions about exclusions were being influenced by funding pressures on schools. Sir Michael said the driving factor in knife crime was more likely to be the "huge rise in serious gang violence" - and called on the police to tackle these gangs. "Unless the police get hold of these gang leaders and do something about them at an early stage, then this problem will continue," he said. But the Metropolitan Police assistant commissioner rejected this, saying it wasn't "that simple". "The idea that if the police sorted out gangs, all the problems we're talking about would go away... I don't think that meets the point," said Mr Simmons. He said the "gang culture" had many different aspects and layers of involvement and overlapped with many other issues, such as drug crime. "We're losing lives left, right and centre," she said. "This really has to stop."